Toronto Real Estate Blog - GTA News : Toronto Homes For Sale! WOW! Great Price Under $400,000 - Perfect For The First Time Home Buyer! Weston/401, Toronto - Toronto Homes for Sale in Downsview! 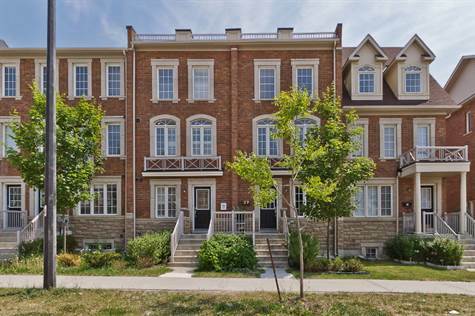 Absolutely gorgeous 3 Storey Townhouse! Spectacular Oakdale Village Weir Model With 4 Washrooms. This 1716 Sqft Home Is Bright And Luxurious. Newly Painted Bedrooms With Spacious Closets And Bright Windows. Easy Access From Garage Into The House From The Ground Floor. Great Master Bedroom With Ensuite Washroom. Quick And Easy Access To Downtown And Hwy. Extras Include: Fridge,Stove, Washer And Dryer, All Window Coverings And Electrical Light Fixtures. Close to great schools including: Yvonne Elementary, Chalkfarm Elementary, Seneca, and more! Minues to Sheridan Mall, parks, and amenities! Convenient access to QEW, 410, and major routes! Be sure to View the Virtual Tour !! Why rent when you can own this condo for as little as 5% down! Thinking of Selling Your Toronto Home - List with Sutton! Low Commission Plans - Free Staging Consultations.